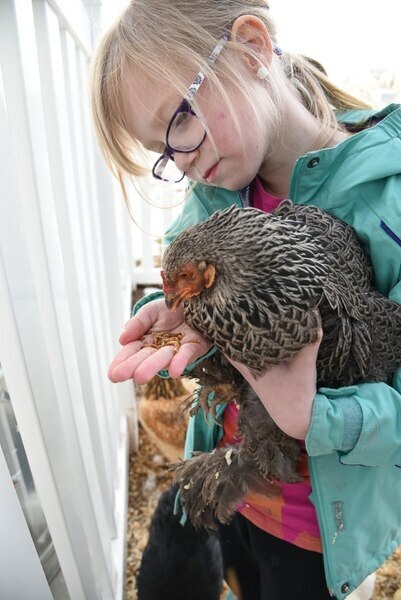 (Francisco Kjolseth | The Salt Lake Tribune) Skyrie Sacks, 7, embraces her favorite chicken named Chansey, one of eight in the family coop behind their house in West Clinton. Suffering a traumatic face injury at the age of 4, Skyrie suffers from PTSD and her mother Natalie says the chickens have helped her through the trauma. A Utah lawmaker is filing a bill that would make it a misdemeanor crime to lie about the need for an emotional support animal. Disability advocates are opposed to the bill, saying it could scare individuals with disabilities into remaining silent about their need for support animals. (Francisco Kjolseth | The Salt Lake Tribune) With a hand full of meal worms, Skyrie Sacks, 7, feeds Chansey one of her favorite treats at her home in West Clinton on Wed. Jan. 10, 2019. Natalie Sacks says emotional support chickens have helped her daughter deal with PTSD from a traumatic accident that happened when she was 4. (Francisco Kjolseth | The Salt Lake Tribune) Skyrie Sacks, 7, pets Poliwag, held by her mother, Natalie, as they visit the backyard coop where all eight of their chickens are named after Pokémon characters. Natalie Sacks says emotional support chickens have helped her daughter deal with PTSD from a traumatic accident that happened when she was 4. But the Sacks family had to move from their home in Herriman because of an HOA dispute over the chickens that made them feel threatened and scared. (Francisco Kjolseth | The Salt Lake Tribune) Natalie Sacks says emotional support chickens have helped her daughter Skyrie, 7, left, deal with PTSD from a traumatic accident that happened when she was 4. But the Sacks family had to move from their home in Herriman because of an HOA dispute over the chickens. A Utah lawmaker is filing a bill that would make it a misdemeanor crime to lie about the need for an emotional support animal. Disability advocates are opposed to the bill, saying it could scare individuals with disabilities into remaining silent about their need for support animals. 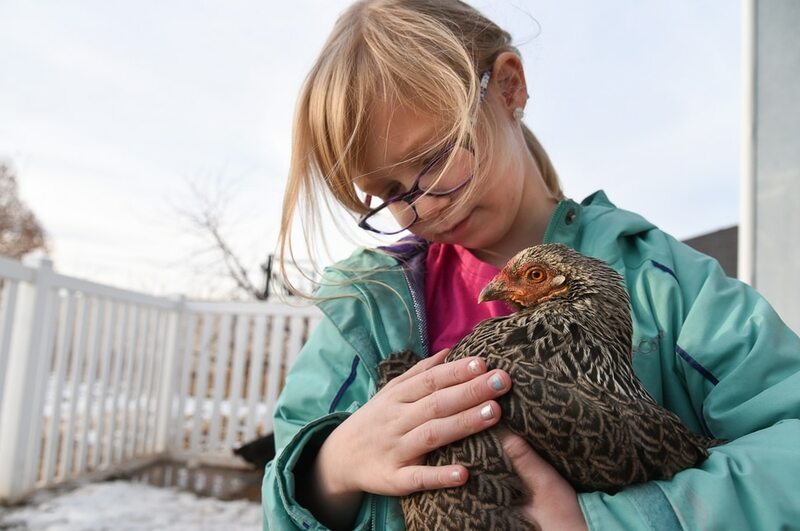 (Francisco Kjolseth | The Salt Lake Tribune) Skyrie Sacks, 7, finds comfort visiting with her eight chickens in the backyard of their new family home in West Clinton. Suffering a traumatic face injury at the age of 4, Skyrie suffers from PTSD and her mother, Natalie, says the chickens have helped her through the trauma. A Utah lawmaker is filing a bill that would make it a misdemeanor crime to lie about the need for an emotional support animal. Disability advocates are opposed to the bill, saying it could scare individuals with disabilities into remaining silent about their need for support animals. 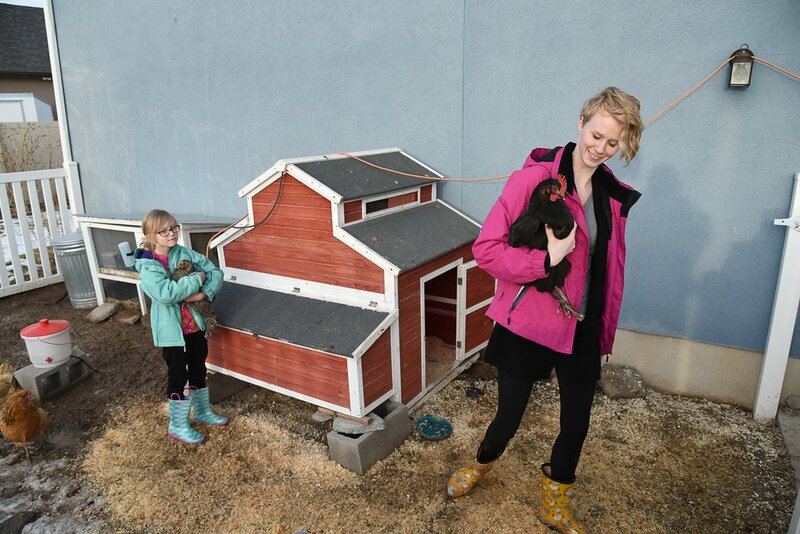 (Francisco Kjolseth | The Salt Lake Tribune) Natalie Sacks is joined by her daughter Skyrie, 7, as they visit with their eight chickens in the back of their new family home in West Clinton. Skyrie, who suffered a traumatic face injury at the age of 4, is helped by the birds in dealing with her PTSD from the accident, according to her mother. The family recently had to move from their home in Herriman because of an HOA dispute over the chickens where they felt threatened and scared. (Francisco Kjolseth | The Salt Lake Tribune) With rubber boots on, Natalie Sacks and her daughter Skyrie, 7, head out to visit with their eight chickens at their home in West Clinton on Wed. Jan. 9, 2018. Natalie Sacks says emotional support chickens have helped her daughter deal with PTSD from a traumatic accident that happened when she was 4. The Sacks family had to move from their home in Herriman because of an HOA dispute over the chickens. (Francisco Kjolseth | The Salt Lake Tribune) Natalie Sacks says emotional support chickens have helped her daughter, Skyrie, 7, left, deal with PTSD from a traumatic accident that happened when she was 4. But the Sacks family had to move from their home in Herriman because of an HOA dispute over the chickens. A Utah lawmaker is filing a bill that would make it a misdemeanor crime to lie about the need for an emotional support animal. Disability advocates are opposed to the bill, saying it could scare individuals with disabilities into remaining silent about their need for support animals. (Francisco Kjolseth | The Salt Lake Tribune) Skyrie Sacks, 7, marches back inside after cleaning poop off her rubber boots after visiting with the family's eight chickens at their home in West Clinton on Wednesday, Jan. 9, 2018. Natalie Sacks says emotional support chickens have helped her daughter deal with PTSD from a traumatic accident that happened when she was 4. The Sacks family had to move from their home in Herriman because of an HOA dispute over the chickens. 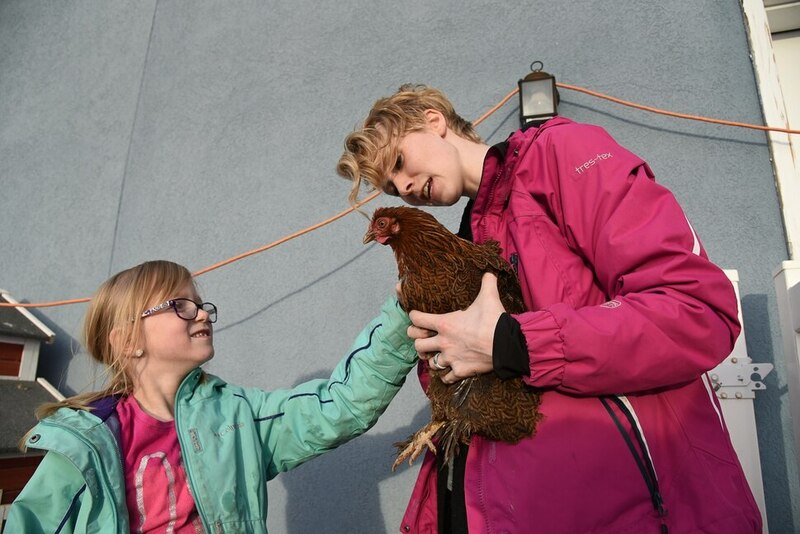 (Francisco Kjolseth | The Salt Lake Tribune) Skyrie Sacks, 7, cuddles a silkie bantam mini chicken named Mew as she and her mother, Natalie, visit the family coop in the back of their house in West Clinton. Natalie Sacks says emotional support chickens have helped her daughter deal with PTSD from a traumatic accident that happened when she was 4. The Sacks family had to move from their home in Herriman because of an HOA dispute over the chickens. (Francisco Kjolseth | The Salt Lake Tribune) With rubber boots on, Skyrie Sacks, 7, visits the family's eight backyard chickens at their home in West Clinton, all named after Pokémon characters, on Wednesday, Jan. 9, 2018. Natalie Sacks says emotional support chickens have helped her daughter deal with PTSD from a traumatic accident that happened when she was 4. The Sacks family had to move from their home in Herriman because of an HOA dispute over the chickens. (Francisco Kjolseth | The Salt Lake Tribune) Skyrie Sacks, 7, embraces her favorite chicken, Chansey, one of eight in the family coop behind their house in West Clinton. Suffering a traumatic face injury at the age of 4, Skyrie suffers from PTSD and her mother, Natalie, says the chickens have helped her through the trauma. A Utah lawmaker is filing a bill that would make it a misdemeanor crime to lie about the need for an emotional support animal. Disability advocates are opposed to the bill, saying it could scare individuals with disabilities into remaining silent about their need for support animals. (Francisco Kjolseth | The Salt Lake Tribune) With a hand full of meal worms, Skyrie Sacks, 7, feeds her chickens one of their favorite treats in the family coop of the family home in West Clinton on Wednesday, Jan. 10, 2019. Natalie Sacks says emotional support chickens have helped her daughter deal with PTSD from a traumatic accident that happened when she was 4. (Francisco Kjolseth | The Salt Lake Tribune) Skyrie Sacks, 7, finds comfort visiting with her eight chickens in the backyard of her family's new home in West Clinton. Suffering a traumatic face injury at the age of 4, Skyrie suffers from PTSD and her mother, Natalie, says the chickens have helped her through the trauma. A Utah lawmaker is filing a bill that would make it a misdemeanor crime to lie about the need for an emotional support animal. Disability advocates are opposed to the bill, saying it could scare individuals with disabilities into remaining silent about their need for support animals. Clinton • Seven-year-old Skyrie Sacks has a backyard coop full of emotional support animals that — like their Pokémon namesakes — began their lives as a humble egg. And, according to her mom, Skyrie is out there with her eight chickens on most days that aren’t freezing or snowing or pouring. If she’s feeling sad, she can cuddle with Mew, a small eruption of white feathers. If she’s full of energy, she can chase Pikachu or Pidgey around their Clinton yard. If she’s feeling generous, she can feed Chansey (her favorite) a special treat: a palmful of desiccated mealworms. The Sackses have paid a price so they could keep the chickens, which help Skyrie cope with severe anxiety and post-traumatic stress disorder from a traumatic accident in 2016. Last year, they moved out of their dream home in Herriman because their homeowner association was adamant that the hens must go, even though Skyrie’s parents handed over letters from a therapist and pediatrician affirming the girl’s need for the support animals. As the use of assistance animals seems to be increasing around the nation (judging by the growing number of businesses claiming to provide certification), so are the conflicts between people who draw strength from their animal of choice and skeptics who feel it’s a trend run amok. In a bid to ease some of these tensions, state Rep. James Dunnigan is now sponsoring a bill aimed at discouraging people from making illegitimate assertions about needing a support animal. It’s already a misdemeanor in Utah for people to falsely identify their dogs as service animals, which are specially trained to perform tasks for individuals with disabilities. Dunnigan argues it should also be a crime for people to lie about needing support animals, creatures that offer therapeutic relief simply by virtue of their presence. The Taylorsville Republican doesn’t expect a sudden rush of pet owner prosecutions but anticipates the provision would act as a deterrent to wrongdoing. An apartment owners association is backing the change to the criminal code, claiming landlords are at their wits’ end dealing with tenants who try to pass off their pets as support animals. Dunnigan said his bill would benefit people with legitimate needs, whose requests are sometimes drowned out by pet owners simply trying to pull a fast one on their landlords or neighbors. “There’s been so many people that say they qualify for support animals, and whether or not they really do is something that landlords are having trouble distinguishing between,” said Dunnigan, whose disclosure forms show he has a financial interest in residential rental condos. But others say the change could create another barrier to housing for people with disabilities. “These people need their support animals so badly that many of them are unable to live independently but for their service or support animal. … [The bill’s] apparent purpose and predictable effect is to dissuade people — real people with real disability-related needs — from seeking to enforce their rights in the first place,” Nick Jackson, a fair-housing attorney at the Disability Law Center, said during an October hearing before the Business and Labor Interim Committee. The legislation won a unanimous recommendation from the committee, with several legislators suggesting that the support-animals situation is getting out of hand. While airlines have been able to restrict emotional support animals, the federal Fair Housing Act requires landlords to make reasonable accommodations by, for instance, exempting a disabled person from a no-pets policy or waiving pet deposits. Utah law also bars landlords from discriminating against renters who own service animals, and Dunnigan’s bill would extend the same protection to people with support animals. Paul Smith, executive director of the Utah Apartment Association, said landlords are seeing a spike in accommodation requests for assistance animals, adding that he’s heard of tenants with support hamsters, iguanas and snakes. And landlords don’t know how to deal with requests they suspect of being fraudulent. Smith says some landlords prohibit pets because they don’t want the animals damaging the rental homes or defecating in common areas. Then there’s the risk of an animal attacking a neighbor. It’s a common topic in good-landlord classes. “I can’t go 10 minutes in any class without someone asking me about an assistant animal request and how to deal with [it],” Smith said. The association does not, however, have any data on the prevalence of false claims about needing service animals. Jackson says he’s unaware of anyone who’s been charged with violating the existing law on service animals. But he has heard of landlords using the threat of prosecution to intimidate tenants with a legitimate need for a service dog. (Francisco Kjolseth | The Salt Lake Tribune) Natalie Sacks says emotional support chickens have helped her daughter, Skyrie, 7, left, deal with PTSD from a traumatic accident that happened when she was 4. But the Sacks family had to move from their home in Herriman because of an HOA dispute over the chickens. A Utah lawmaker is filing a bill that would make it a misdemeanor crime to lie about the need for an emotional support animal. Disability advocates are opposed to the bill, saying it could scare individuals with disabilities into remaining silent about their need for support animals. Jackson said landlords already have a legal recourse if they suspect someone of being untruthful: They can ask for evidence that a therapist or doctor sees the tenant’s need for a support animal and deny the request if the person doesn’t have sufficient corroboration. Some lawmakers have said procuring documentation can be as easy as filling out a form on a website and submitting a payment; Jackson said there are disreputable online businesses that prey on disabled people, but landlords tend to spot and reject these shady certificates. At times, disabled individuals are left without access to the animals that assist them, Jackson says. The law center has one client who owns a service dog to help him cope with a congenital heart condition that causes him to pass out a couple of times each day. The dog is trained to stabilize him or even break his fall if he faints, Jackson said. The man’s landlord initially refused to let him keep his dog at home because his written documentation from a cardiologist was more than a year old. It took Jackson’s client several months to make a new appointment and get updated papers from his clinician. Some people with disabilities are so afraid of eviction that they give up their assistance animals or find different housing, he said. Smith contends that legitimate owners of service dogs or support animals have nothing to fear from Dunnigan's proposed law. Natalie Sacks said she has some sympathy for landlords and believes there are people who abuse the concept of emotional support animals. But just because an animal is a little unconventional doesn’t mean it’s not a real source of comfort for someone with a disability, she said. When Skyrie was 4 years old, she slipped on gravel outside her home in Herriman and smashed the right side of her face against the pavement. She’s already had two surgeries, and she’s facing a lifetime of potential complications, her mother said. For a while after the accident, Skyrie seemed trapped in states of anxiety and fear. She wouldn’t even play outside. The family bought the hens about a year ago for the eggs and didn’t initially regard them as support animals, Natalie Sacks said. That changed as loved ones watched Skyrie transform in front of them.